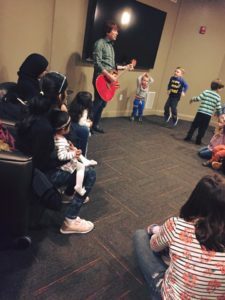 The Children's Room aims to offer a range of free activities that support the library's mission to connect residents to resources, services, and experiences that educate, enrich, and entertain. Stay tuned here and to the Events Calendar as we navigate the world of construction and renovation! Pay particular attention to the location of each program, since we are traveling around town. The library strives to nurture early literacy skills in even the youngest of children. Our story times and related programs (including sing alongs!) align with research on early childhood development. In particular, we draw inspiration from Mother Goose on the Loose and Every Child Ready to Read. Both of these programs emphasize engaging with the whole child. By creating a playful, welcoming environment, we hope to help children develop positive associations with the library and with reading. 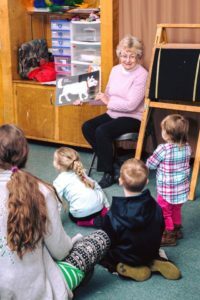 We also model ways for caregivers to share books, songs, and nursery rhymes with their children, so adults should come to story times prepared to participate! Our current story times are held at the Senior Center at 144 School Street and at Washington Crossing at 55 Cedar Street. They are for ages 5 and under, and they do not require registration. 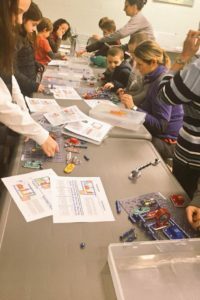 While the library is under construction, the Children's Room has joined forces with the Senior Center to offer a unique opportunity for kids and seniors to work together. These intergenerational programs focus on hands-on problem-solving, creativity, and fun! So come play with us! This book club for 4th and 5th graders meets monthly during the school year, giving members a chance to discuss each month's title over book-themed snacks and crafts.